An agency investigating a deadly boating accident involving two NFL players and their friends in the Gulf of Mexico has concluded it was a caused when the vessel was improperly anchored and the boat capsized after one of them tried to throttle forward to pry loose the anchor. The Florida Fish and Wildlife Conservation Commission's investigation also cited carelessness and operator inexperience as contributing factors. The combination of errors also came at the time a storm front was moving in, making conditions on the water very rough. Oakland Raiders linebacker Marquis Cooper, free-agent NFL defensive lineman Corey Smith, and former University of South Florida players William Bleakley and Nick Schuyler departed from Clearwater Pass, Fla., early Feb. 28 to go offshore fishing for amberjack. Early that morning, the men went more than 50 miles offshore in Cooper's 21-foot vessel. It was loaded with two large coolers filled with ice, drinks, food and beer. All of the friends were dressed in warm clothes, sweat suits and jackets. When Cooper tried to thrust the boat forward, the vessel became submerged and capsized, tossing the men overboard. They tried to upright the boat without success. Bleakley swam underneath and was able to retrieve three life vests, a large cooler and a makeshift flotation device. Bleakley, who Schuyler has credited with saving his life, used the makeshift flotation device, which has been described previously as a cushion. The other three wore the vests. The men appear to have tried everything in their power to rescue themselves: Schuyler told the agency they tried retrieving and using flares without success. They also tried getting their cell phones, which were in plastic baggies. Cooper's flotation device was removed and Bleakley put it on. The Oakland Raiders linebacker then became separated from the boat. About an hour later, Smith started show "possible extreme symptoms of hypothermia." 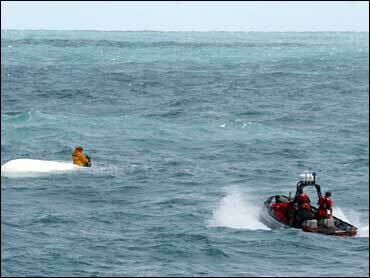 He removed his flotation device and also became separated from the boat. The accuracy of that account was somewhat unclear because Schuyler was suffering from hypothermia and spoke to them shortly after he was pulled from the boat. His doctor said he probably could have only lived another five to 10 hours.